Where Do They Go When They Die? I think his name was Skyler. Or it could have been Schuyler or Skylar – I never saw it written down. I first knew him as “that guy that looks like your friend Duane.” This from my husband, pointing out a skinny kid sitting at the bus stop. Once he was pointed out to me – the resemblance between him and my friend was uncanny – I saw him everywhere. He bused tables at the restaurant where we ate breakfast on Tuesdays. He stocked groceries at the store in town that also sold cool purses and fun lamps. He was forever either waiting at or walking home from the bus stop closest to the end of our street. I heard his name from his mother one day when he’d come into the restaurant with his mom while the Pirate and I were having breakfast. While he went into the back to take care of something, his mother complained to the waitress about the problems he was having with his boss at his other job, and I was impressed that such a young kid – he was probably 16 at the time – was working two jobs. I saw him walking around town with a pale-skinned brunette, and was happy that he’d gotten himself a girlfriend. I saw him at the high school when I dropped my older kid off in the mornings or at school events and asked my kid if she knew him. I began to wonder if he noticed me noticing him. I almost felt like I was stalking him in some random, accidental way where I didn’t really mean to see him all the time or know anything about him, but I did. It surprises me to this day that I never exchanged a single word with him. If I passed him in the supermarket, he continued to put cans on shelves without saying a word. When I drove past him at the bus stop, I never stopped to give him a ride, and he never waved his hand in greeting. I wouldn’t even know if I was as familiar to him as he was to me. His parents helped him buy a sports car for his high school graduation. Part of the reason he’d been working two jobs was to save for this car that he’d been wanting for years, and I admire that kind of perseverance in a kid. The night of graduation, he and his girlfriend and a couple of six packs went for a drive. And none of them made it home. When I heard about Ray Bradbury passing, I thought about Skyler. He was the kind of kid that Bradbury wrote about. Cool in an average-kid way. Someone that you know, but not nearly well enough. Kind of like Ray Bradbury himself. I’ve never read anything about Bradbury, apart from what was written on the back of dust jackets. To me, I didn’t need to know about the writer in order to enjoy the work. When the big flaming green head in The Wizard of Oz yelled “Pay no attention to that man behind the curtain,” I took those words to heart and have never interested myself in biographies of writers, behind-the-scenes tours of Disneyland attractions or the special “making of” features on DVDs. I don’t care how the effect is achieved. I just care that it’s there. But what that means is that the Bradbury I knew is wholly one of my own making. And what I make is a guy who had a cool job, and who did his cool job really well for a long time. He seemed like a regular guy who probably wore old man pants that made him look a little like a chimpanzee, and ugly button-down shirts, and washed his hair with bar soap. I need to think of him as human, rather than superhuman, because if he is superhuman, it makes it a little harder for the rest of us who write to measure up. If he’s just a guy with a cool job that was good at it because he worked hard, well, I can do that. Skyler might have grown up to be a cool guy with a cool job he was good at. 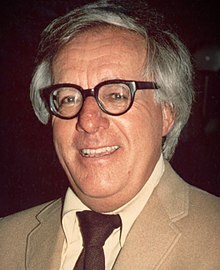 Wherever he is now, he gets to be with Ray Bradbury in the place in my mind and heart reserved for those people who have impressed themselves on me, even though we’ve never met.